A concise, illustrated explanation of how upflow, downflow, and horizontal forced-air furnaces work. 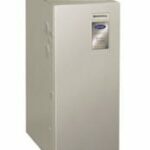 Central forced-air heating systems are by far the most popular method of heating homes in North America, no doubt because they can deliver heated air from a central furnace or heat pump to every room of the house and can also do double duty for delivery of air-conditioned air. 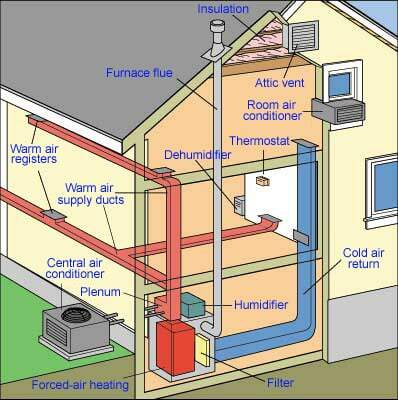 Of course, forced-air systems include a few other parts and pieces that refine their work to maximize energy efficiency, including filters to clean the air, registers to direct and control the flow of air to rooms, and, in the case of heaters that utilize combustion fuel for heat, a flue for venting gases to the outdoors. When the thermostat tells the system that room temperatures are below a set comfort level, the air handler kicks on, drawing room air from a “cold-air return” through duct work into the furnace’s heat exchanger, a metal chamber around which air flows. 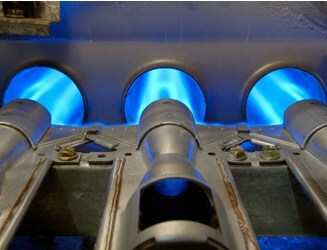 The burners or electric heating elements turn on or the heat pump engages to heat the air as it moves through the air handler. The blower then forces the warmed air through a network of duct work back to the rooms. The cycle continues until the set comfort level is reached and the thermostat turns the system off. Furnaces come in “upflow,” “downflow,” and “horizontal” models designed to accommodate basement, attic, or limited-space installation. An upflow furnace is generally placed in the basement; as its name suggests, the heat from it flows upward. A downflow furnace typically goes in the attic. A horizontal model usually goes in an attic with very limited headroom.